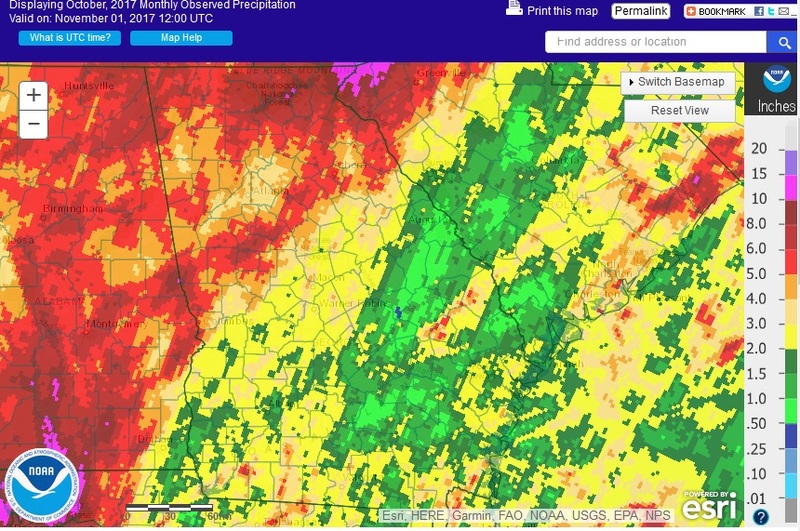 Precipitation across Georgia in October varied quite a bit across the state. Areas affected by Hurricane Nate in the northwestern half of the state were generally wetter than normal while other areas missed by Nate and thunderstorms from a strong front later in the month in the coastal plains were fairly dry. The entire state was one to four degrees warmer than normal for October. In Atlanta, the monthly average temperature was 65.7 degrees F (2.4 degrees above normal), in Athens 64.3 degrees (1.3 degrees above normal), Columbus 69.5 (3.0 degrees above normal), Macon 67.4 (2.5 above normal), Savannah 71.2 (3.3 above normal), Brunswick 73.5 (3.3 above normal), Alma 71.3 (2.9 above normal), Augusta 68.5 (4.1 above normal), Albany 71.4 (3.3 above normal), Rome 63.2 (2. 1 above normal), and Valdosta 70.4 (1.7 degrees above normal). High temperature records were set at numerous stations on October 10, 11, and 12, and high minimum temperature records were set across the state on October 8 and 9, with nighttime temperatures generally in the low to mid 70’s. In Atlanta those records had remained unbroken since 1884 and in Augusta since 1882, and Augusta’s records were broken five mornings in a row. High minimum temperatures were also broken on October 10 in Savannah, Alma and Brunswick and on October 13 and 14 in Brunswick. 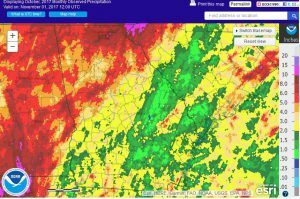 The highest monthly total precipitation from National Weather Service reporting stations was 5.71 inches in Athens (2.16 inches above normal) and the lowest was Augusta with 0.83 inches (2.44 inches below normal). 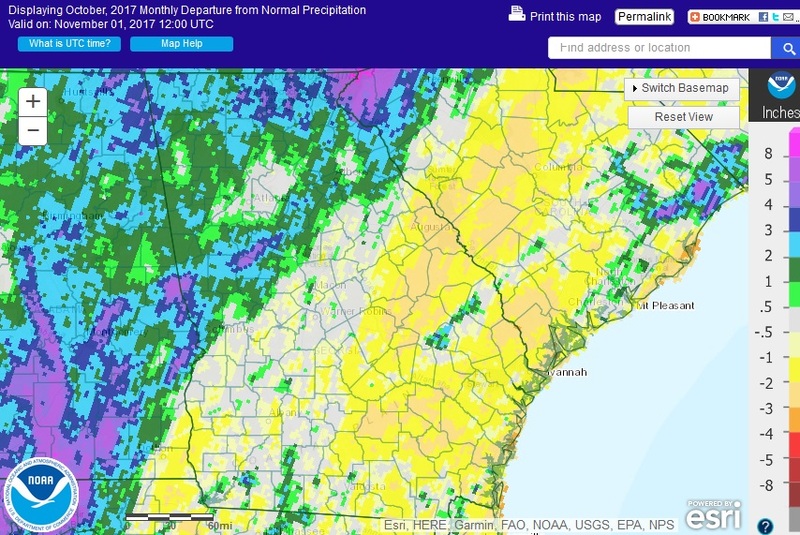 Atlanta received 3.87 inches (0.46 inches above normal), Columbus received 4.62 inches (2.04 above normal), Macon 2.94 inches (0.15 above normal), Rome 4.90 inches (1.04 above normal), Savannah 1.65 inches (2.04 below normal), Albany 2.01 inches (0.58 below normal), Brunswick 2.01 inches (2.45 below normal), Valdosta 3.79 (0.59 above normal), and Alma 1.66 inches (1.37 inches below normal). One daily rainfall record was set in October. Columbus received 2.10 inches on October 23, surpassing the old record of 2.03 inches set in 1945. 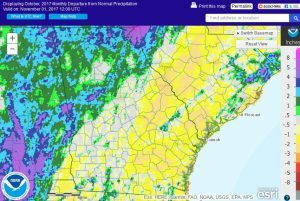 The highest daily rainfall total from CoCoRaHS observers was 7.22 inches near Dillard in Rabun County on October 9, followed by 4.76 inches measured near Rayle in Oglethorpe County on October 24. The Dillard amount was during the passage of Hurricane Nate, and the Rayle rainfall was during a strong cold frontal passage. For the entire month, the highest total was 16.31 inches measured by the Dillard observer, followed by 10.21 and 9.72 inches from two Rabun Gap observers and 9.46 inches by another observer near Dillard; all of these observations were in Rabun County in the northeast mountains. CoCoRaHS observers in northern Georgia also noted some ice pellets and snow flurries on October 29 and 30, although no accumulations were measured. In spite of the passage of the remains of Hurricane Nate during the month, only three official reports of damage from high winds were made during the entire month, one on each of three separate dates, although some additional reports were noted in local newspapers. Parts of the state that did not receive significant rain from Hurricane Nate or frontal showers were designated as abnormally dry by the Drought Monitor by the end of the month, although no drought conditions were identified. Agriculture in general benefited from drier conditions across the state as harvest of cotton, peanuts, and soybeans was underway. The lack of moisture late in the month, particularly in the southeast, hindered the maturity of late-planted cotton and peanuts and made it difficult to dig peanuts ready for harvest. It also caused delays in planting of winter grains and forage across the state. Some farmers reported that losses of cotton and other crops due to Hurricane Irma earlier in the year are larger than expected, and that clean-up of peach orchards from the storm is slowing down farmers’ ability to harvest pecans. The outlooks for November and for November through January show that warmer and drier conditions than normal are expected across the state, consistent with the predicted development of a La Niña in the next few months that is expected to last until spring. For more information please see the “Climate and Agriculture” blog at http://site.extension.uga.edu/climate/ or visit our web page at http://www.gaclimate.org. We are now also on Facebook at SEAgClimate and on Twitter at @SE_AgClimate. Please feel free to email your weather and climate impacts on agriculture to share on the blog to pknox@uga.edu. Posted in Climate summaries, Uncategorized. Bookmark the permalink.